"Discipline must come through liberty...We do not consider an individual disciplined only when he has been rendered as artificially silent as a mute and as immovable as a paralytic. He is an individual annihilated, not disciplined." Dr. Maria Montessori was a leading thinker in education whose ideas were, in many ways, ahead of her time. She was a visionary and Italy’s first female physician. Dr. Montessori was born in Chiaravalle, Italy in 1870, and became one of that country’s first female physicians in 1886. Through her profound interest in child development and scientific observation of children from various backgrounds and cultures, she developed a unique method of education. She acutely studied and observed how children learn, and concluded that children teach themselves based on what they find in their environment. She gave up her medical practice and university professorship to found the first Montessori school, Casa dei Bambini, or Children’s House, in the San Lorenzo neighborhood of Rome. In teaching those sixty children, she developed the philosophy, methods, and materials that has eventually became known as the Montessori approach. Dr. Montessori wrote, “The most important period of life is not the age of university studies, but the first one, the period from birth to age six, for that is the time when man’s intelligence itself is being formed.” Recent scientific research has confirmed that children develop 50% of their mature intelligence from conception to age 6. 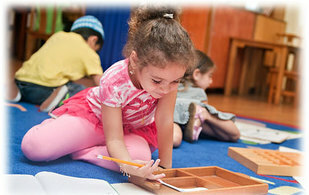 Montessori education develops the child in all of its holistic dimensions. The Montessori curriculum encourages self-discipline, self-knowledge, independence, academic skills, problem-solving ability, social development, and an enthusiasm for learning through a combination of a self-regulated and multi-sensory approach. One of the most essential, stimulating, and supportive elements in children’s learning is the prepared environment. Working within a classroom, well-equipped with a wide range of carefully designed, hands-on materials, children are encouraged to explore, understand, and experience the joy of discovering the world around them. In a typical Montessori classroom, the teacher or guide blends in with the children. The children independently choose their own activities, which are designed to teach daily living skills, from cooking to sensorial acuity, numeration and arithmetic, as well as writing skills and reading. The guide gives individual or group presentations of the material to those who need them. Children become self-regulated through concentrating on stimulating self-chosen tasks that they can pursue individually or in groups; Montessori called this process “normalization.” There is a progression of activities which require focused movement, balanced body coordination and high levels of concentration. Among these are “walking on the line” and “the silence game” where children are invited and encouraged to be physically still and focus on the objects in the classroom environment, taking these children to the highest level of discipline and self-control.